Yobe State University, YSU Unified Tertiary Matriculation Examination, UTME First [1st], Second [2nd], Third/Final Batch Admission List for 2018/2019 Academic Session. Download in PDF. This is to inform all candidates who applied for admission into the Yobe State University via UTME are hereby informed that the admission list for 2018/2019 session has been released. Candidates can now proceed to check and confirm their admission status. I wish to congratulate the candidates offered provisional admission in the First, Second, Final Batch of 2018/2019 admission exercise. However, candidates are advised to visit the jamb portal to Change of Institution and Proceed to accept the admission offered to them. 2. Any candidate offered admission into a programme other than his/her first choice should kindly visit the JAMB Portal to effect change of course/institution. 3. 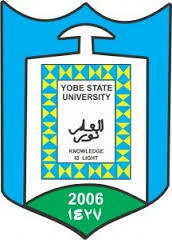 Any candidate who applied for admission into Yobe State University and posses the minimum entry requirement for UTME or DE, and whose name did not appear on this admission list should kindly visit the jamb portal to upload his/her 'o' level results or 'O' level and 'A' level in the case of UTME and DE candidates respectively. 4. ALL SUCCESSFUL CANDIDATES SHOULD IMMEDIATELY COLLECT THEIR ADMISSION LETTERS AND PROCEED FOR REGISTRATION AT UNIVERSITY CONVOCATION SQUARE, WHICH WILL CLOSE ON SATURDAY 15TH DECEMBER, 2018. CANDIDATE WHO FAIL TO REGISTER WITHIN THE STIPULATED PERIOD WILL NOT BE ENTERTAINED.